Unibet are quite a unique brand in the betting industry. They are one of the few Scandinavian companies to have really seen any widespread success within the industry and whilst there are others that have done well, Unibet are probably as big as they come. The sports betting side has been a huge factor in their business model since they opened their virtual doors in 1997. Today is no different and the website has been seeing an increase in exposure with its merger into the Kindred Group. When the sportsbook first opened, we remember that Unibet were always one of the best prices in the market. They often were able to beat that of much more established brands and we would say that this is one of the mina reasons why they have been able to see the success that they have. The pricing structure is a vital part for any punter. At the end of the day, you can have all the fancy gimmicks that you want on site, but if your betting odds are rubbish, you aren’t going to get too far for too long. As always with these tests we are going to start at the top with the Premier League, before working our way down into the lower leagues of English football. 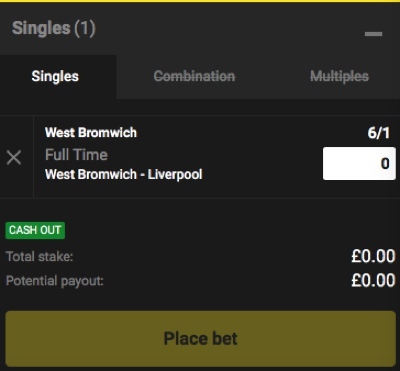 With literally the first game that we opened between West Brom and Liverpool we were able to quickly see that Unibet were already offering a best price in the industry for a West Brom win, as you can see below. They were off to a flying start in our test, but it’s also worth noting that they are only just behind the best price for the Liverpool game and that of the Draw as well, which is really quite impressive. Obviously, this is just one market, so we crackled on. But, just a couple of markets later we saw that again they had another best price, this time for the Stoke v Burnley game, as highlighted below. But again, the thing to note is that whilst there is a best price in there, the consistency with the other bets cant be ignored. We realise that the 20 or so games that we have been able to test in the Premier League is pretty small when it comes to the sample size, but we were continued to be impressed by the whole package that’s on offer. They actually put quite a few of the bigger bookmakers to shame with their odds. You can do your own comparison with the bookmakers above to get a feel for how they have performed. The great news is that as we moved down the leagues to the likes of the Championship, the great prices just kept on coming. We’ve two more examples below where they have a best price attached, but also, look at their other prices as well. Neither are far off at all! It’s fair to say that just about everyone in the office has been really taken aback by the pricing structure at Unibet. They’ve always been solid, and I will say sample size again, but from what’s been put in front of us to test out, they are about as good as we have seen. The market coverage is one of the best we’ve seen as well with a staggering 300 markets to choose from within the Premier League and these numbers continue to impress even as you move down the leagues. Basically, the whole pricing and markets section has been massively impressive to say the least and we’re already starting to wonder why Unibet aren’t getting more coverage within the industry, especially in the UK? There’s little doubt that the site relies on English betting, but that being said the coverage from across Europe and even around the world isn’t all that bad. The one that we will say now, and nothing to do with overage, is the layout with the site, literally listing all of the leagues on one page, with no grace to be honest. They lose marks here! That aside, whilst hard to navigate, they do offer a good range. The likes of La Liga and Bundesliga are going to see the most action and cover the most ground, which is pretty standard. As you work into smaller leagues from around the world and generally outside of Europe, coverage does tend to suffer slightly, and games can have as few as 10 markets, which is pretty low. On the whole, we would say that 90% of punters will be more than satisfied with coverage outside of the UK and the other 10% maybe looking for a little bit more in terms of both matches and markets. Asian lines are exactly something that is new to the industry or that doesn’t have a number of bookies already covering it. But, the coverage that Unibet gives it is so good that we felt compelled to include it in the review. We aren’t actually sure if there are any other bookies that offer as many Asian line bets as Unibet. For just a single Premier League game they had over 50 markets to choose from, which is staggering. These include the lines of the Asian Handicap, but also half betting, totals and cards, to name a few. The range of the handicaps was massively impressive as well, often something that gets overlooked in favour for simply a +/- 1.5 goals bet which many bookies see as suffice. The betting guide on site has been set up for people who are new to the industry or are new to a particular sport. They’ve brought together a number of articles that are designed to help people not only understand how these sports work in terms of betting on them, but also some strategy to help make them some more money. Whilst the guides are definitely targeting a number of demographics and won’t appeal to all, we actually found them really well written and easy to read. 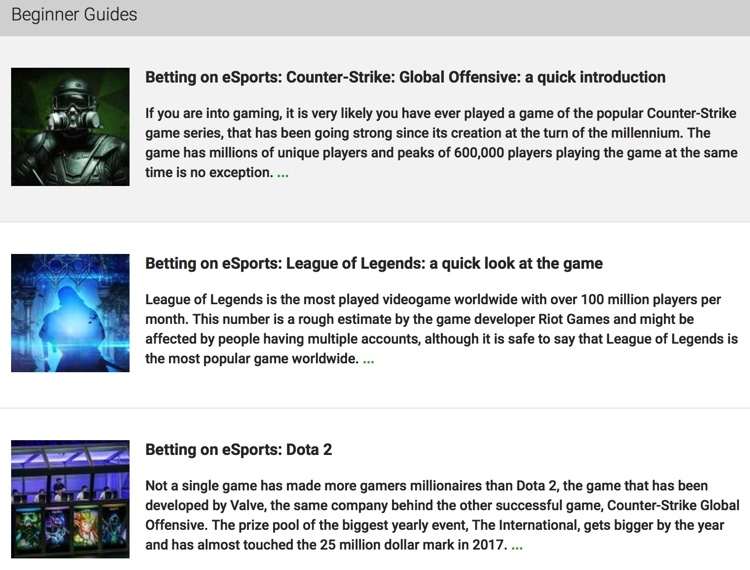 For example, we (I) don’t know an awful lot about esports betting, but their guide actually allowed me a much better understanding. Cash out betting is an option to use at Unibet, which is great. They offer a good range of markets when betting on football and with it allow you to see if that bet can be cashed out prior to placing the bet. Now, it took us a while to find the ‘symbol’ that they referred to that highlights these markets and later found it that it doesn’t actually show you it until you add it into your betslip. TO be honest, we would have liked to see it before doing this, but it’s not so big a deal. The process only allows you to do full cash outs for now, but we were advised that this was going to change to partial cash out in the not too distant future, although not confirmed. Not much use to you, we know, but thought it best to let you know if that’s important to you. The in-play betting section is a really nice looking area. There are bits that we do and don’t like about the overall dosing on site, but this is definitely one of the better looking live betting sections that we have tested. As you can see from the screenshot above, the market coverage does tend to settle down slightly as matches kick off. The Millwall v Fulham game started off around 250, but as the game has worn on, it’s been reduced to around 60 or so. 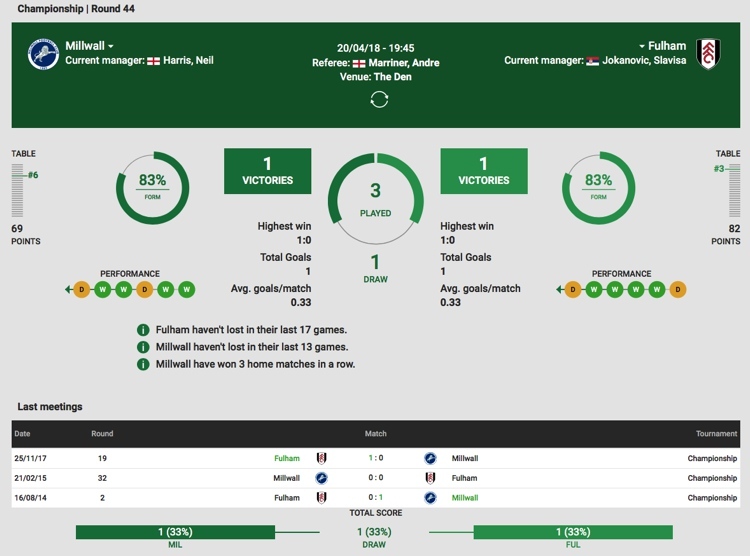 You’ll also notice that the overview allows you to see some key facts for each game. This obviously includes the score, but you can also see when games have had a red card and when games are live on the live streaming platform within the site. Once you break into the game itself it really starts to open up for you in terms of the features within the live betting section. You get a three columned attack, with the games down the left, markets in the middle and then a mix of stats and match centre down the right. It functions pretty well to be honest and whilst the layout took a little getting used to as it’s quite narrow, does actually work quite well. The stats section at Unibet is powered by that of Sports Radar. We arent actualy all that familiar with SProt Radar, but from looking at how well Unibet’s fucntions, we can definitely say they are right up tehre with the best. The page includes a lot of data, most of which can be applied to specific betting markets, which is great. At the top you get a quick look at the current form of each team, games played between them both and also some key stats, which can be huge for finding a bit of value from your bets. Banking at Unibet is pretty straightforward and they offer a good range of methods including Visa, MasterCard, Skrill and Neteller, along with other e-wallets and pre-paid cards. There are no fees to pay for depositing, but it’s worth noting that you can’t make your first deposit on account with either Skrill or Neteller, so you will have to use an alternative method for this. We’ve reviewed and revisited quite a few bookmakers of late on the site, but none have been more impressive than that of Unibet. The site has made huge strides over the last few years and it’s really quite baffling why they aren’t possibly getting the credit and recognition we think they deserve. The bookmaker is offering great prices and odds for a start, that couple with one of the biggest market ranges that you can get make for a great combo. 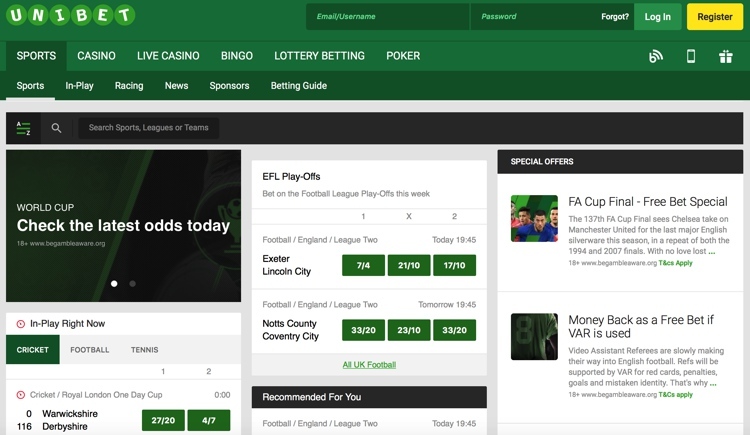 It maybe doesn’t have the features of gimmicks that some sites offer, such as request a bet type offers and such, but we don’t think that it needs it. It manages to get the basics right and offers people good coverage and good prices. You can’t really ask for anything more than that in our opinion and will be a great place to try if you haven’t already signed up after the review of the odds and marekts section that is!